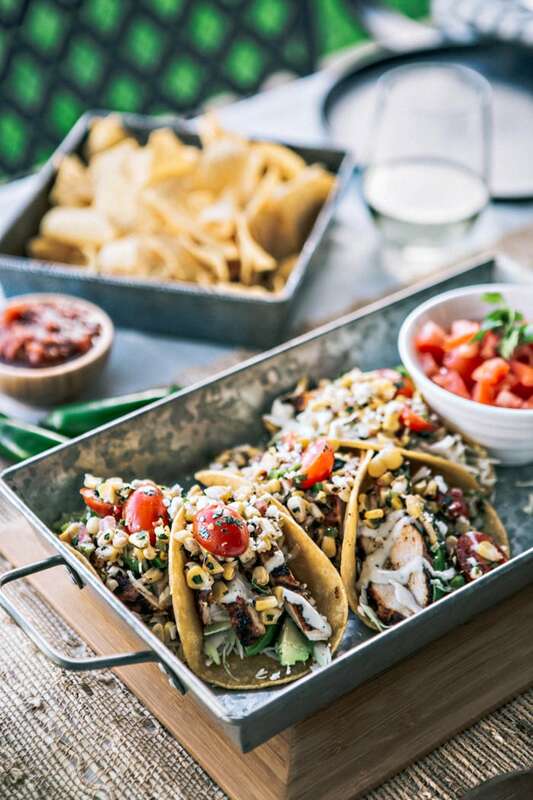 A big thank you to Line 39 Wine and Weber® Grills for sponsoring this recipe for Chicken Tacos with Grilled Corn Tomato Salsa. Please note that this is content for 21+. One of my favorite ways to cook in the summer is on the grill. Last summer we landscaped our backyard starting from zero. Kevin and I both love to be outside and to be able to entertain outdoors at home during the summer. It was really important to us that our backyard reflect that, so we spent months working on everything from a design to plant selection, to the actual labor of planting plants and trees, and hauling rock, mulch and sod. After that, there were weeks of making sure plants were getting enough water and fertilizer, weeding, and pruning. Then, we looked for things like patio rugs and furniture, a fire pit and chairs to go around it, and then added our favorite outdoor patio lights that we used to have at Kevin’s old house. It is the perfect place to spend the evening enjoying a backyard barbecue with a glass of Line 39 Wine. Another reason I love grilling so much is that it can get really hot in the kitchen during the summer. I love to keep the heat where it belongs – outside! The Weber® Q®1200 Grill is great for summertime grilling. It is portable, so we can move it from the backyard to the front yard really easily. Sometimes we like to do front yard block party style parties and it is so nice not to have to drag a large, heavy grill around to the front yard for that. love to go boating in the summer too, and it is nice to have family or friends up to the lake with us and to cook dinner at the picnic area at the beach. Having a portable grill is perfect for that. What I like the best is that this is a real gas grill, not a heated camp griddle type burner. It has porcelain-enameled, cast-iron cooking grates which get nice and hot and provide an excellent sear. I love that the lid has a built-in thermometer so you can monitor the grill temperature. You have plenty of prep space thanks to folding side tables, and you don’t have to worry about messes wherever you place the grill because there is a drip pan underneath. Our latest backyard grilling included a fun summer taco night. I made a Grilled Chipotle Lime Chicken and a Grilled Corn Tomato Salsa. 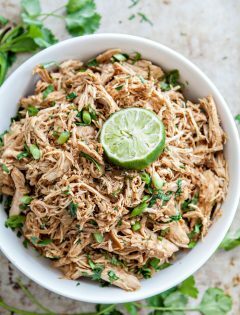 This recipe might look a little complicated, but I’ll share my secret hack for easy summer meal prep so that this recipe is much easier to prepare and doesn’t consume so much of your evening. 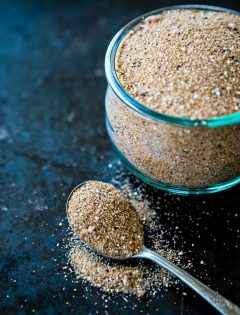 My secret hack isn’t really that secret – it is just to do prep work ahead of time, and on this recipe there is plenty of that that can be done. First off, to make the Chipotle Lime Grilled Chicken recipe super simple to make, prepare the marinade up to a week ahead of time, or longer, if you’re extra organized. Then, add fresh chicken breasts to a gallon sized zip top bag, pour the marinade over the chicken, squeeze out as much air as possible from the bag and zip to close. 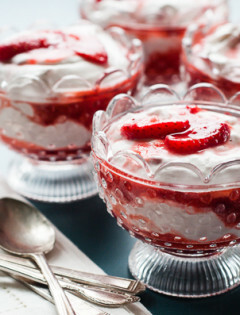 Store in the freezer until 2 days before you plan to serve. Remove the bag from the freezer and let the chicken thaw in the bag with the marinade until you plan to grill. 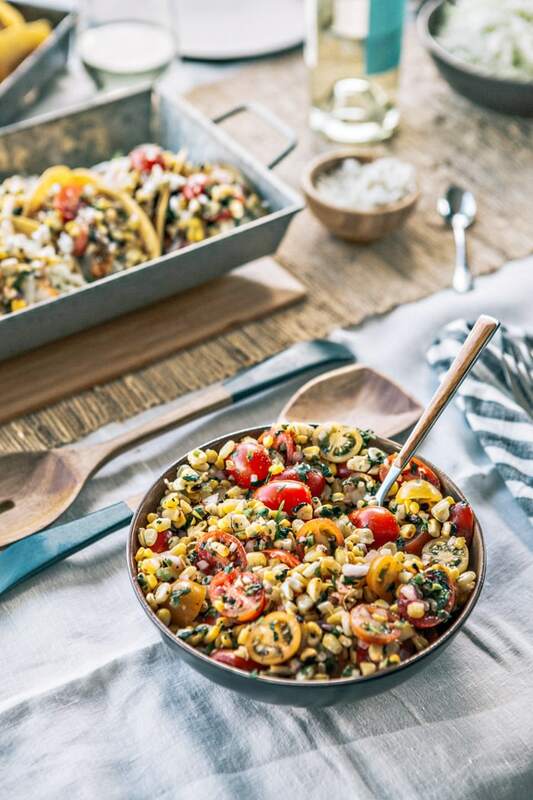 The Grilled Corn Salsa can be made a day, or even two, in advance. 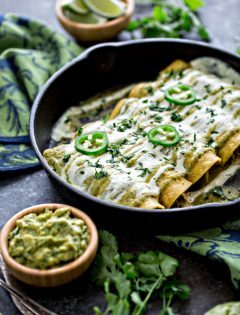 This allows day-of preparations to be limited to grilling chicken, heating tortillas, and prepping any condiments or accompaniments for the side. You can definitely make this salsa with canned or frozen corn, but grilling the corn and getting a nice black char on some of the kernels really amps up the flavor. It is so good. All of the kids loved it! Which I thought was really interesting since of the 4 kids, only one of them usually likes to eat corn at all. Our extras included shredded cabbage, cotija cheese, avocado ranch, sliced avocado, chips and salsa, and green rice. For the adults, we paired the tacos with Line 39 Sauvignon Blanc. If you’re more of a red wine lover, Line 39 Cabernet Sauvignon is another great choice. It has a rich flavor of blackberry and plum and is smooth and subtle, perfect for pairing with grilled meats. 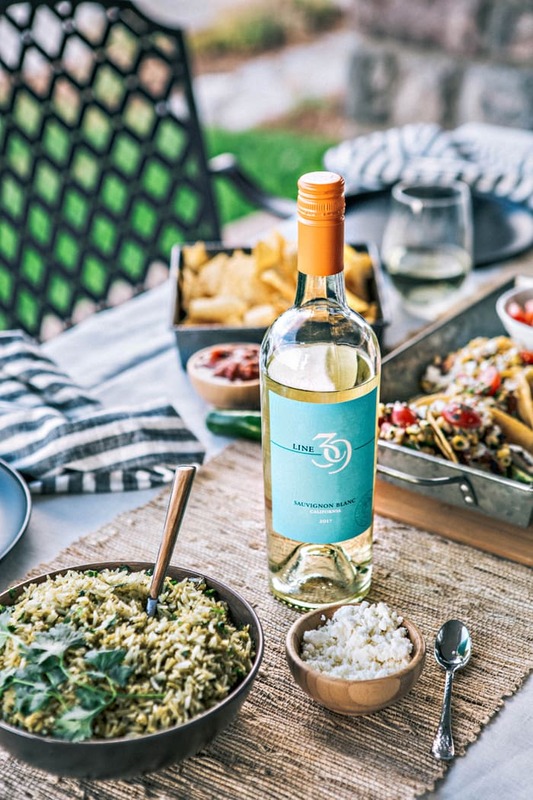 Line 39 Wines are great for summer get togethers because they have a price point of about $11. They’ve consistently won Best Buy accolades for delivering on quality vs. price. I love purchases that are such great values! Guess what? 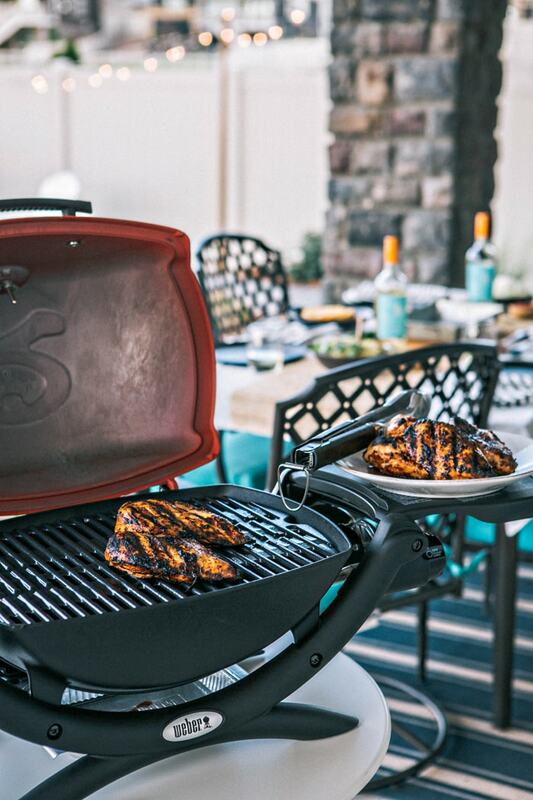 Line 39 Wine is teaming up with Weber® Grills for a super fun summer sweepstakes! 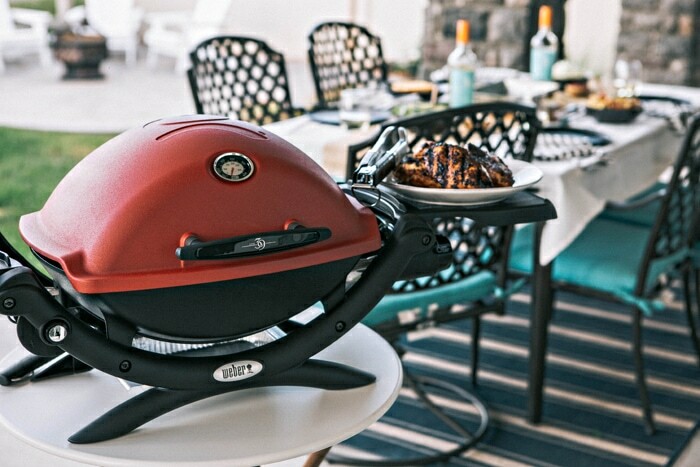 Visit line39bbq.com or text BBQ to 797979 for your chance to win a Weber® Q®1200 Portable Gas Grill for all your outdoor adventures and backyard barbecues. 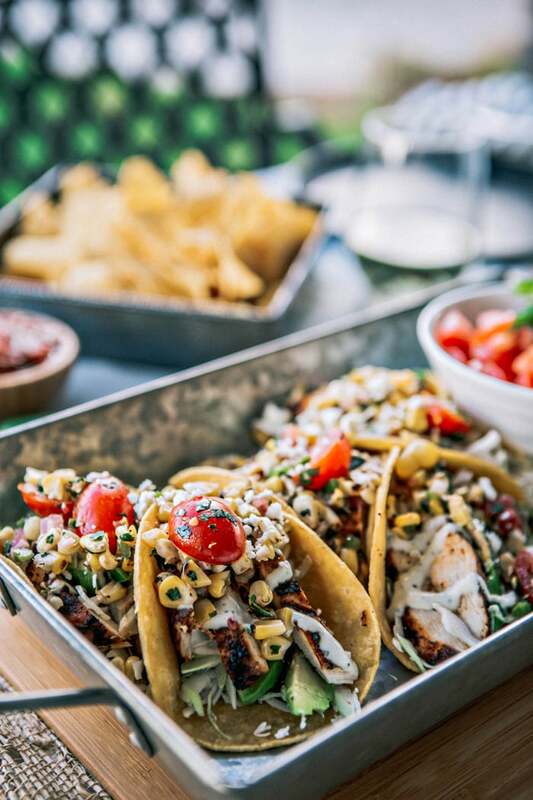 Then, you should totally make this recipe for Chicken Tacos with Grilled Corn Tomato Salsa using your new grill if you win. See line39wines.com/sweeps for official rules and look for displays in store. Looking for more ways to grill out back this summer? 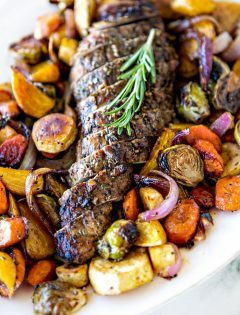 Check out some of our favorite grilling recipes below. I think all of these would pair great with Line 39 Sauvignon Blanc. Don’t see what you’re looking for here? 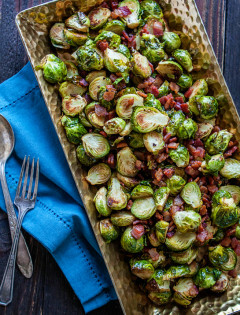 Browse the recipe index archives for even more delicious recipe ideas. In Pesto Pork Chop and Summer Vegetable Foil Dinners, fresh, summertime vegetables are tossed in pesto and balsamic and cooked with boneless pork chops in this makeover version of the classic foil dinners from childhood. Don’t like pork? Substitute chicken in your preferred cut. Fresh summer meals and outdoor entertaining are where it is at when it comes to this Greek Pork Kebab Platter with Greek Pico de Gallo. Juicy chunks of pork tenderloin are grilled with onion, lemon, and oregano and served platter style with Greek Pico de Gallo. In this recipe for Basil Kumquat Grilled Chicken Skewers with Cauliflower Steaks, chicken tenderloins are marinated in a summery basil kumquat vinaigrette and grilled, then served alongside grilled purple cauliflower steaks for a simple, yet inspired, summer dish. Grilled Mediterranean Vegetable Salad is the perfect way to cook and serve vegetables this summer. The Tomato Balsamic Vinaigrette is the superstar of this dish. 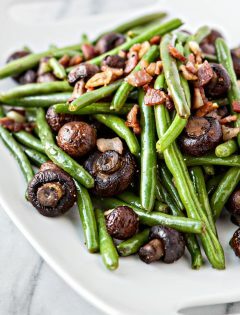 This is perfect for a lighter meal or a summer side dish. Honey Lemon Chicken Kebabs on Couscous are a super easy summertime grilling meal! 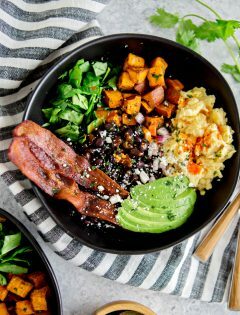 I like to use zucchini, red bell pepper, and red onion for the veggies, but you can use whatever summertime vegetable are your favorite (or what you happen to have on hand). These Grilled Baby Artichokes with lemon and garlic would make a great happy hour appetizer paired with a glass of wine! In a large stock pot, bring water to a boil. Add the corn to the water, and boil for 7 minutes. Meanwhile, heat your grill to high heat. After the corn has boiled, remove it from the water using tongs. Place it on a plate and pat dry to remove any excess water. Brush the corn with the olive oil. Then transfer the corn to the grill and cook on high, rotating every minute or two, until the kernels are golden and some of them have a nice char on them. Remove the corn from the grill and cool to room temperature. While the corn cools, combine the remaining ingredients for the corn tomato salsa in a medium mixing bowl. Cut the corn kernels off of the cooled corn and add to the mixing bowl. Stir to combine. Refrigerate for up to 2 days before serving. 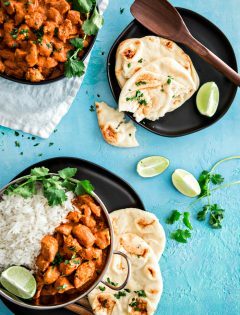 Place all of the ingredients except the chicken and optional garnishes into a blender or food processor and puree until smooth. In a gallon sized zip top plastic bag, place the chicken breasts. 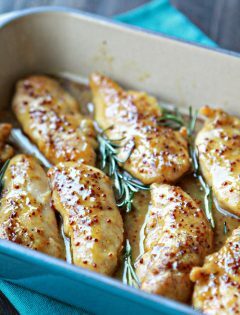 Pour the marinade over the chicken, zip to seal, and allow to marinade in the refrigerator for at least 4 hours, flipping the bag half way through. When ready to cook, preheat the grill to medium-high heat. Remove the chicken from the marinade, discard the marinade, and place the chicken on the grill. 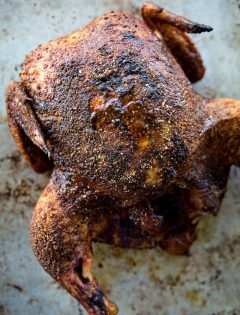 Cook for 5 - 7 minutes on each side, or until the chicken has cooked through to a temperature of 160 degrees F.
Remove chicken from the grill, place on a cutting board and loosely cover it with foil. Allow the chicken to rest 5 - 10 minutes. Slice the chicken into 1/2 inch thick slices, place on a serving platter. 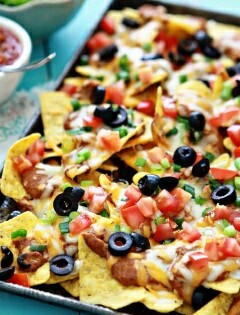 Add you preferred ingredients along with the corn tomato salsa and grilled chicken to a tortilla. Serve. To make this recipe super simple to make, prepare the marinade up to a week or two ahead of time. Then, add fresh chicken breasts to a gallon sized tip top bag, pour the marinade over the chicken, squeeze out as much air as possible from the bag and zip to close. Then, store in the freezer until 2 days before you plan to serve. Remove the bag from the freezer and let the chicken thaw in the bag with the marinade until you plan to grill. 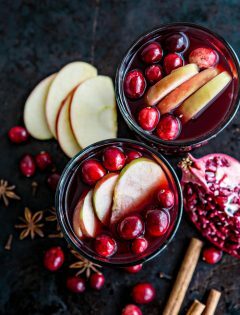 This recipe was created in partnership with Line 39 Wine. 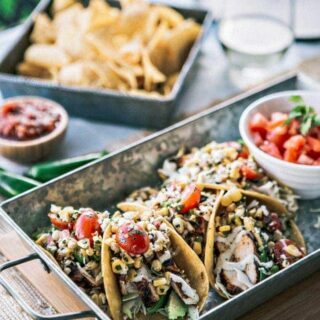 I have been compensated for my time creating this recipe for Chicken Tacos with Grilled Corn Tomato Salsa, however all of the contained opinions are my own.